[106 Pages Report] The global point of care molecular diagnostics market was valued at USD 632.5 Million in 2017 and is projected to reach USD 1,440.2 Million in 2023, at a CAGR of 14.7%. The scope of the study includes POC molecular diagnostics analyzers and assays that enable healthcare professionals in the detection of diseases through molecular technologies in point-of-care settings. The base year considered for the study is 2017, and the forecast for the market size is provided for the period between 2018 and 2023. Both, the top-down and bottom-up approaches were used to validate the size of the global Point of care molecular diagnostics market and estimate the size of various other dependent submarkets. Major players in the market were identified through secondary research and their market presence was studied through primary and secondary research. Secondary research included the study of the annual and financial reports of top market players, presentations, websites, and press releases of top players, news articles, journals; and paid databases ,white papers, medical journals, certified publications, articles from recognized authors, directories, and databases such as World Health Organization (WHO), European Diagnostic Manufacturers Association (EDMA), Centers for Disease Control and Prevention (CDC), National Institutes of Health (NIH), In Vitro Diagnostics Associations and Journals, Annual Reports, SEC Filings, Company Websites, Investor Presentations. Primary research included interviews with key opinion leaders such as CEOs, vice presidents, directors, marketing executives, and related key executives from various companies. The percentage splits, shares, and breakdowns of the segments were determined using secondary sources and verified through primary sources. This data was consolidated and added to detailed inputs and analysis from MarketsandMarkets and presented in this report. The key players in the global Point of care molecular diagnostics market are, Roche Diagnostics (Switzerland), Biomerieux (France), Danaher (US), Abbott Laboratories (US), Quidel (US) and Meridian Bioscience (US). In 2017, Alere Inc. (US) received a CLIA waiver from the FDA for the Alere i RSV Rapid Molecular Test used to detect RSV (respiratory syncytial virus) infections. In 2016, Roche Diagnostics Limited (Switzerland) was granted a CLIA waiver from the FDA for the cobas Influenza A/B & RSV test to be used on its cobas Liat System. This was the first CLIA-waived PCR test used to detect Influenza A/B & RSV within 20 minutes. 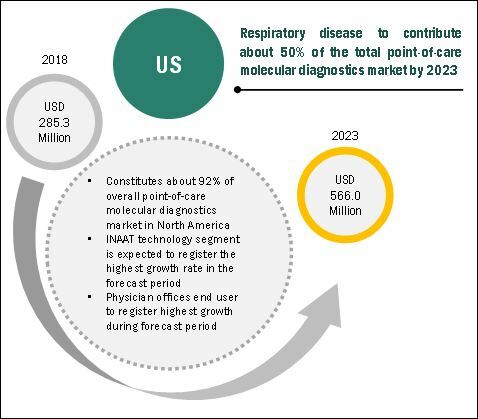 The point-of-care molecular diagnostics test is an emerging trend in respiratory and sexually transmitted disease application, what is the current scenario and at what rate is the market expected to grow in the future? What are the key factors that will drive the fastest-growing technologies of the market in the next five years? New product launch has been the key strategy adopted by diagnostic players to enter into this competitive market. How will this impact the growth rate in near future? The global point of care (POC) molecular diagnostics market is projected to reach USD 1440.2 million in 2023 from USD 725.5 million in 2018, at CAGR of 14.7%. POC molecular diagnostics are various point of care portable device and assays & kits used by healthcare professionals to detect and diagnose diseases in human samples such as serum, blood, throat swab, and stool. In this report, the market has been categorized based on product & service, applications, technology, end user, and region. Based on the applications, the market is segmented into respiratory diseases, hospital-acquired infections (HAIs), sexually transmitted diseases (STDs), oncology, hepatitis, and other applications (meningococcal meningitis, malaria, Herpes Simplex Virus, Ebola, Zika virus). The respiratory application segment is expected account for the largest share of the global POC molecular diagnostics market in 2018. This large share of this segment can be attributed to the rising prevalence of influenza A & B and increasing research investments by key players for other respiratory disease such as Strep A and TB. In addition to this, most of the FDA approved RT-PCR POC molecular diagnostics are focused on influenza disease. 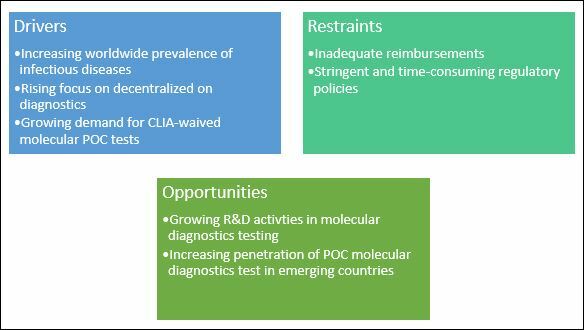 The POC molecular diagnostics market is broadly segmented into instruments, assays & kits, and services & software based on the basis of product & service. Assays & kits segment is expected to account for the largest share of the global POC molecular diagnostics market and expected to register the highest CAGR during the forecast period. POC molecular diagnostic assays and kits are specially designed for points of care such as hospital critical care units, physician offices, outpatient clinics, and community health posts. POC molecular diagnostics assays and kits enable the early diagnosis of respiratory tract infections, women’s health and sexual health conditions and among others. The POC molecular diagnostics market is segmented into RT-PCR, INAAT, and others technologies. In 2018, the RT-PCR segment is expected to account for the largest share of the global POC molecular diagnostics market. The large share of this segment can be attributed to the growing use of RT-PCR in proteomics and genomics and access to portable, easy-to-use devices. In the last three years from 2015, more than 42 RT-PCR based products have been launched for various diseases. In 2018, North America is expected to account for the largest share of the global POC molecular diagnostics market. Growing prevalence of infectious diseases, increasing number of CLIA product approvals, and rising government initiatives are the major factors driving the growth of this market in North America. However, Asia Pacific is expected to grow at highest CAGR during forecast period. The key players in the global POC molecular diagnostics market are Abbott Laboratories (US), Biomerieux (France), Danaher (US) Roche diagnostics (Switzerland), Meridian biosciences (US), Quidel (US). These players focus on organic strategies such as product launches & approvals, to sustain their growth in the POC molecular diagnostics market.